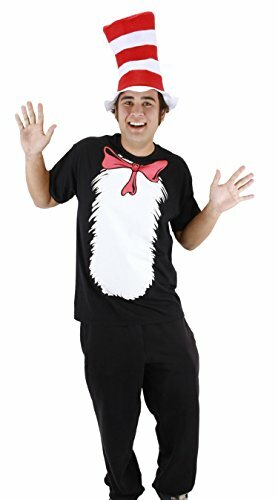 Channel Dr. Seuss' iconic Cat in the Hat with this Dr. Seuss Cat in the Hat Short Sleeve T-Shirt with Hat (Mens M). This easy-to-wear costume kit features a black tee with printed details of the Cat's white fuzzy patch and bow tie. Top off the ensemble with the red and white stovepipe hat and you'll be ready to have some fun at your next event.